Tswalu Kalahari is South Africa’s largest private game reserve, now protecting over 110,000 hectares of spectacular grasslands and mountains. No more than 30 guests at a time can discover the beauty of this arid savannah, its diverse wildlife, and the serenity of what may well be South Africa’s last great wilderness. The Motse lies at the foot of the Korannaberg mountains facing westwards across the grasslands of the Kalahari. Motse means “village” in Tswana, and this little village consists of just 9 spacious and secluded “legae” (Tswana for “little house”). These legae are built of desert sand, local stone, rich red clay, and traditional Kalahari thatch. Each comprises a spacious bedroom with an open fireplace, an en-suite bathroom with both an indoor and outdoor shower, and a large study area. 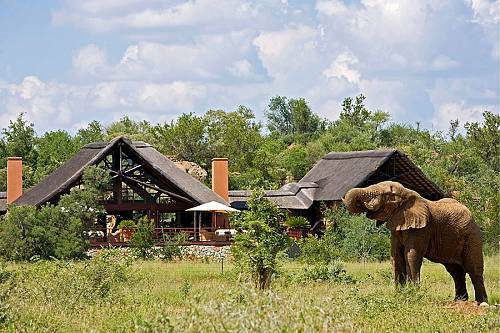 The private sun deck overlooks a waterhole which attracts animals of every kind.